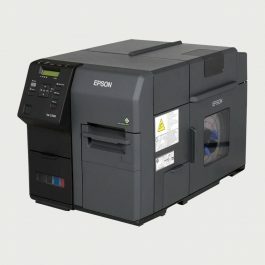 Epson C7500GE Graphics Edition Inkjet Color Label Printer – Color Label Solutions, Inc. Guest checkout option — place order without an account. We refreshed our online store. If you have an existing account and are unable to log in, please create a new account. Our apologies for the inconvenience. If you still have problems, please let us know, by sending an email to: websupport@colorlabelsolutions.com Thank you! 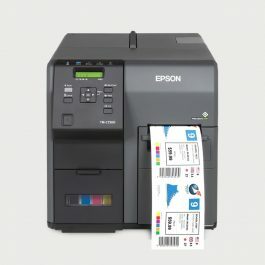 The Epson C7500GE is perfectly suited for professional label print shops, users seeking the highest quality images and the ability to match precise colors for fast prime label printing. High productivity “mini-press” for short run jobs. The Epson C7500GE combines the C7500G with Wasatch CMYK raster image control to produce prime labels at high speed. Bundle with the Wasatch SoftRIP raster image control software, one-year on-site warranty and six months of Wasatch SoftRIP technical support. 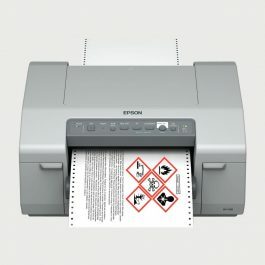 The Epson C831 inkjet color label printer is perfect for producing drum and pail labels up to 8.25” wide and 22” long to meet the GHS label requirements for chemicals. 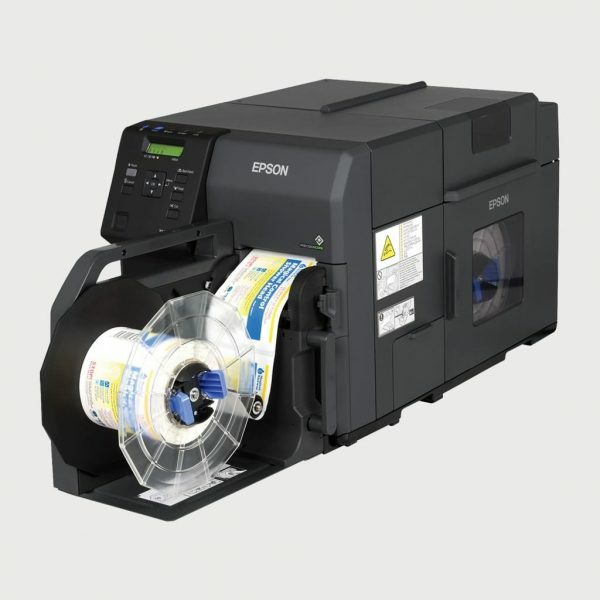 The Epson C7500G inkjet label printer offers on-demand, full-color glossy label printing at speeds up to 11.8″ per second. Built for reliable, high-quality performance, the Epson C7500G is ideal for demanding, high-volume environments that require durable, glossy, customized labels at a low cost per label. The Epson C7500 Inkjet Color Label Printer is changing the label printing industry. Fast, high resolution, full-color label printer for Just-In-Time color printing of large print jobs. Color Label Solutions is a value-added reseller specializing in print-on-demand color label systems. We have deployed print-on-demand color label solutions in hundreds of companies and industries; providing our customers with online training and support. Let us help you make color labels a reality for you. Check out Our Blog, Facebook and LinkedIn pages for the latest information on Color Label Solutions, Inc.
© 2019 All rights reserved. Color Label Solutions, Inc.